There are multiple interactive attractions and some fantastic photo opportunities for capturing some weird and wonderful memories. The Curious Corner of Chamarel was an idea that was first formulated over four years ago. We wanted to create a really unique attraction that would appeal to both local and international visitors from all locations, as well as people of all ages from 3 to 103. We have had a team working on this concept for the last 4 years. Construction of the unusual building started in January 2013. The team consisted of a number of Mauritian craftspeople, the CCC shareholders (David Hartshorn and Paul Rose) and a number of renowned UK artists/designers, as well as a genius called Edward Gray, who did a truly amazing job. We opened at the end of February 2014. Why not Mauritius? 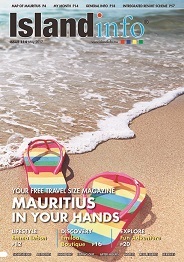 We looked and could see that many Mauritians were looking for ‘alternative’ and new leisure-based things to do, away from the more traditional activities. Chamarel is a great location with fantastic climate. The site has wonderful green vegetation that has provided the Curious Corner of Chamarel with a beautiful tropical garden setting for our café and boutique. Chamarel is also home to one of the world’s great natural ‘curiosities’ - the iconic Seven Coloured Earth, so it seemed an obvious location for the Curious Corner to be situated. In the 8 months we have been open, we have received over 25,000 visitors and great reviews on Facebook and Trip Advisor (on which we are now rated the No 1 attraction in Chamarel and No. 7 in Mauritius). The response has been very satisfying, after a lot of hard work and effort, it has far ex-ceeded our expectations and has been achieved mostly by ‘word of mouth’ marketing. The goal of creating an at-traction for people of all ages has also been achieved, with frequent comments we receive from couples visiting with their kids being “the kids enjoyed it loads, but we enjoyed it more”. WHAT IS THE MISSION OF YOURCOMPANY? The goal of our company is simple for all our visitors to have a truly unique and enjoyable experience and go away with a great big smile on their face and ‘curious’ look in their eye. All the team at CCC would like to say a huge thank you to all the people who have visited the Curious Corner of Chamarel and then told their friends, shared their experience, and liked rated us on Facebook, or reviewed us on Trip Advisor. Or helped ‘spread the word’ about the Curious Corner of Chamarel in any other way. We really appreciate the generous support we have received from the many ‘curious’ people out there. I personally and on behalf of my partner would like to say well done and thank you to all the Curious Corner of Chamarel staff, for their fantastic efforts in helping to create the ‘CCC Experience’. We have received some fantastic comments from many many visitors – so congratulations, thanks and keep it up.